TUNIS, Tunisia Gunmen shot dead the leader of a leftist Tunisian opposition party on Thursday morning, this year's second political assassination in the birthplace of the Arab Spring and another blow to the country's rocky transition to democracy. 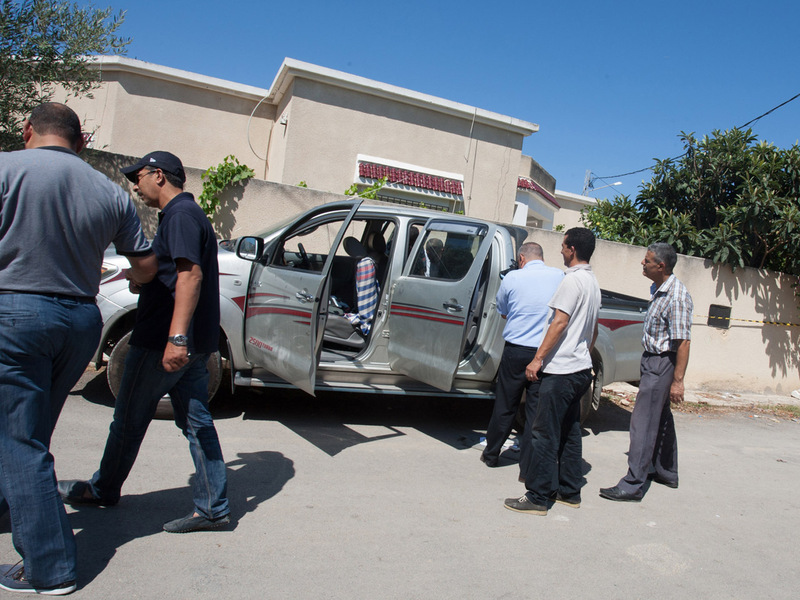 Mohammed Brahmi, 58, of an Arab nationalist political party was in his car outside his home when gunmen fired several shots at him, said Interior Ministry spokesman Mohammed Ali Aroui. The two attackers then sped off on a moped, according to a neighbor cited by the state news agency. Local media reported Brahmi was shot 11 times. The United States strongly condemned the assassination and called for a thorough investigation to bring those responsible before the courts, reported Reuters. "This is not the first political assassination since Tunisia's revolution and there is no justification for such outrageous and cowardly acts in a democratic Tunisia," State Department spokeswoman Marie Harf told a daily briefing. "We urge the Tunisian government to immediately conduct a transparent and professional investigation to ensure that the perpetrators are brought to justice in a timely manner," added Harf, according to Reuters. It is the second killing of an opposition member this year, following that of Chokri Belaid, a member of the same leftist Popular Front coalition as Brahmi. Belaid was also shot dead in his car outside his home in February. His killing provoked a political crisis that nearly derailed Tunisia's political transition. Tunisia is led by the moderate Islamist Ennahda Party, which dominated elections in October 2011 and rules in a coalition with two secular parties. The opposition has criticized Ennahda for not cracking down on Islamist extremists, and many members of Belaid's party hold the government responsible for his assassination. Soon after news broke, crowds gathered outside the Interior Ministry in the heart of Tunis calling for the downfall of the government. There were also demonstrations in many parts of the country, including in Sidi Bouzid, Brahmi's impoverished hometown that was the birthplace of the uprising against the dictatorship in 2011. Crowds in the nearby town of Meknassi burned down the local headquarters of Ennahda. "This day signifies the death of the democratic process in Tunisia," Nejib Chebbi of the liberal opposition Jomhouri (Republican) Party told local radio. "The government must leave." Crowds gathered outside the hospital in the Ariana suburb of Tunis where Brahmi's body was laid out after he was shot. They then crowded around and hung onto to the ambulance taking it away for the official autopsy. "This is really going to put Ennahda on the spot right now," said Laryssa Chomiak, director of the Tunis-based Institute for Maghreb Studies. "The Tunisian public was not happy with the way in which the Chokri Belaid assassination investigation was dealt with... if they mess this up, I think it's going to be extremely bad for them, for their domestic support." The leader of Ennahda, Rachid Ghannouchi, told The Associated Press he was "very shocked" by this assassination, which comes just as the country needs stability to complete the new constitution and political transition. "Tunisia was getting ready to crown its efforts to complete its transition, it was the last candle still lit," he said, referring to other Arab countries that revolted against dictatorship but have since known political instability. "The enemies of democracy want to snuff it out to enmesh Tunisia in the troubles found in the other countries of the Arab Spring." On July 3, Egypt's elected Islamist government was overthrown by a military coup  an event closely watched by other Islamist parties that came to power in post-Arab Spring elections. The killing comes as Tunisia was celebrating the 56th anniversary of becoming a republic after gaining independence from France. Mustapha Ben Jaafar, the speaker of the national assembly in which Brahmi was a legislator, announced Friday would be a day of mourning. Tunisia is struggling with its democratic transition after overthrowing dictator Zine El Abidine Ben Ali in January 2011. It faces a faltering economy, popular unrest over unmet expectations and a rising extremist Islamist movement. The government has blamed Belaid's assassination in February on Islamist extremists and said that six suspects are still on the run and their names will soon be revealed. Belaid's death prompted the resignation of the prime minister and a cabinet reshuffle. The latest assassination comes as Tunisia's drawn out transition approaches a milestone. The new constitution has been written and will be voted on in the coming weeks. Prime Minister Ali Larayedh promised on Monday that elections for a new president would be held before the end of the year.